Liquify warp tool is used to distort facial features - the chin is lengthened, and nose as well. Eyes are brought up on outside corners. Brush work is now done on the face to smooth it and to reshape the nose. This is the point that the decision was made to go to a larger canvas and draw in witch hat, broom and clothes. A brush tool was used to do this. Area around the face have been chopped out, and work is started on further refining the hat and using brush tools to fill in color. Rather than black, a dark reddish brown is used so that shadow layers in finished image will be black after burn tool is used. Blue background layer is added and then a large yellow circle is brushed on to become the moon. This was added now so that the witch could be designed to work well with the circle shape background. Using brush tools, dress is filled in and one leg and shoe begun. Shoes are both in, and further work done on shading of dress, hat and shoes using burn tool for shadows. 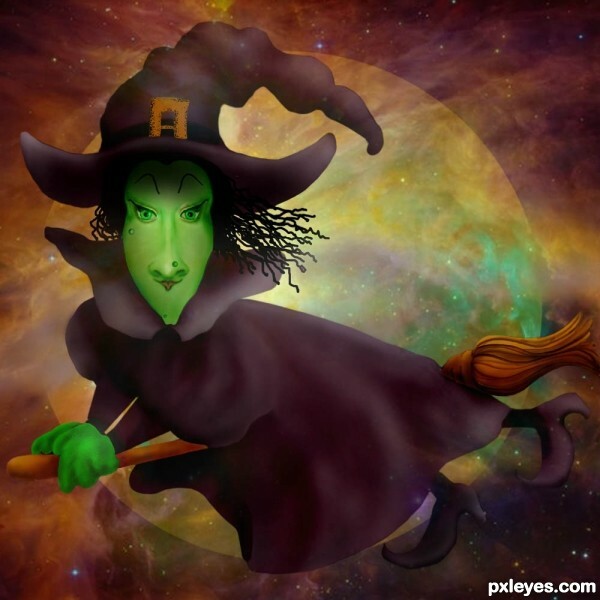 Broom has been finished using brush tools, warts have been added to witch's face with brush tool, burn and dodge tools, then hair is added using a hard brush tool with squiggly lines. Background fog is added in several shades of gray, using soft airbrush. Nebula Orion source used for pattern layer over other layers.